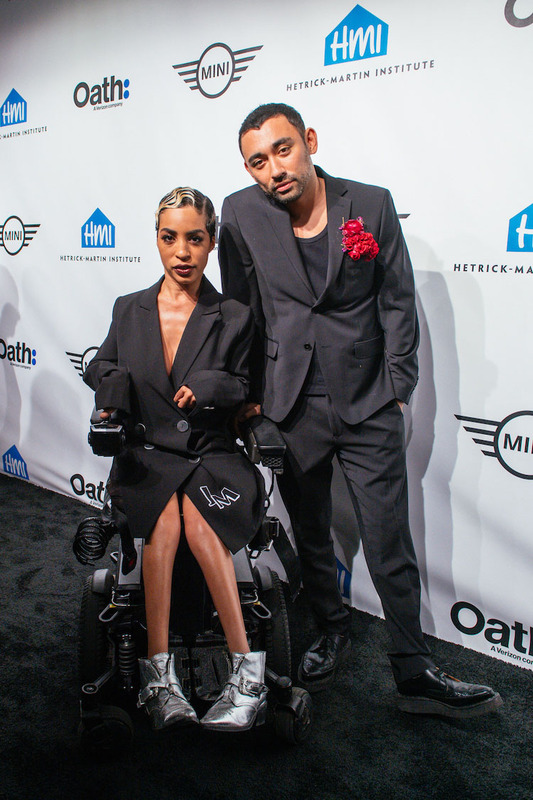 After presenting him with an Emery Award, Jillian Mercado spoke with Nicola Formichetti about fashion, Lady Gaga, and LGBTQ+ youth. The Hetrick-Martin Institute recently recognized individuals and organizations within the LGBTQ community who've demonstrated outstanding leadership. Among those honored was fashion's golden boy, Nicola Formichetti. Having worked with Uniqlo, Diesel, Mugler, and Lady Gaga, his work has pushed boundaries and embraced a gender-neutral future for fashion. Following the ceremony, we spoke with Formichetti about the award. In addition to his recent work with Gaga, we discussed the evolving fashion industry and how he's found inspiration in the LGBTQ community. OUT: Nicola, it was such an honor to present to you as a friend but also someone who has contributed in the LGBTQ+ community, can you explain a little bit about the award you’ve won from Hetrick-Martin, and why it's so important to you? Nicola Formichetti: I’m so humbled to have been recognized from such an amazing organization like HMI. Their efforts make it possible for teens to live happy, healthy lives. They have truly created a safe environment for LGBTQ+ teens and their efforts have changed so many lives for the better. Humbled and emotional after being honored at the @hetrickmartin #EmeryAwards. I do what I do because I want everyone, especially queer youth, to have the safe spaces they need to express themselves. Let's continue to work towards a future where everyone can achieve their dreams. And thank you @jillianmercado for presenting me with the award - people like you are what inspires me to keep going. How have you tried to empower LGBTQ+ youth through your work? Everything I do, seeing and creating fashion, is to empower people, particularly the youth. In the past, I have always tried to use my voice to speak to others about their experiences growing up LGBTQ+. Whether it be creating a gender-neutral line or building an office environment that was inclusive and diverse, I have always sought to make others feel welcome and safe. I hope by using my platform to continue to speak about these topics, I empower others to be their most authentic selves and be kind to others who are looking to do the same. Specifically, I wonder about your collaboration with Lady Gaga. What did her impact and resonance show you about queer youth and culture? Working with Gaga presented an opportunity to truly think freely about expression and creativity. While our work was so personal and from our unique collaboration, the result resonated on a very universal level. I saw LGBTQ+ youth feel as though they were finally being spoken to and recognized. Through the music, they were also able to find a sense of belonging and community. What do you think is the most fascinating thing about LGBTQ+ culture right now? Even in such a challenging time, there’s so many positive things coming out of the community. I’m touched seeing the amount of optimism and determination come out of our community. There were so many historic firsts coming out of this election season – first lesbian woman in the House, first openly gay governor, etc. and that all comes as a result of individuals not willing to give up. Awards like tonight honor the span of your entire career. What would you say was a turning point for you in your own professional development? For me, it was when I first moved to London from Japan and Italy, I worked with a community of LGBTQ+ people who really inspired me. Although, it’s hard to pinpoint one turn of events in my career as my work is never ending and I’m always moving forward with tons more to do. What advice do you have for young people who are eager to enter the fashion industry? Today, the fashion industry is changing a lot because of social media and different technology. You can learn so much more, it’s so much more democratized. My advice is to use this: study a lot, learn what you like. It’s not just about shopping. Hustle, meet people through social media. Work for someone first before you start your own thing. What was a mistake you made along your journey that you look back on today? My life has been a series of mistakes but I don’t see them as a negative thing, they’re all positive experiences. I never assisted anyone or went to school so I learned by making mistakes. I still make mistakes today but I’m not scared to do so. What was your biggest “pinch-me” moment of your career? I always thought of myself as a behind the scenes guy so it was crazy to me when people began to recognize me on the street. It was a moment in which I realized I had a voice people wanted to listen to. What are you working on right now that you’re excited about? I am working with Lady Gaga around her Enigma Vegas show which is going to be a super-duper crazy experience. There’s still a lot more details to come but I can’t wait to share it with you all. What is your biggest hope for the fashion industry in the years to come? Fashion should always be on the forefront of culture but the fashion industry is always a bit behind. I want the industry side to be open to younger generations, be more inclusive and welcoming to different cultures, abilities and backgrounds. Who are some people that inspire you right now and why? The younger generation, they speak their minds and they’re not scared to raise their voice. What’s something that will always be a part of your wardrobe? Anything black that I don’t have to think about too much.